Killer Characters: Merry Christmas from Bella in Seattle and a #Giveaway! Merry Christmas from Bella in Seattle and a #Giveaway! Happy holidays, everyone! Bella here from Tracy Weber’s Downward Dog Mystery series, wishing you a glorious holiday season. We almost never have a white Christmas in Seattle anymore. My human slave, Kate blames it on something she calls global climate change. Still, people here get very much into the season’s celebrations with glorious light displays, Christmas carol singing, and more gift giving than even a hundred-pound German shepherd like me can shake a stick at! As you can see, I’m getting into the spirit this year. I’m not sure why Kate insisted on dressing me up in this ridiculous Santa Dog outfit, but who am I to spoil her fun? Besides, she promised me that as soon as she’s done taking photos, I’ll get to open up all of those presents. I already know what’s inside them, of course. 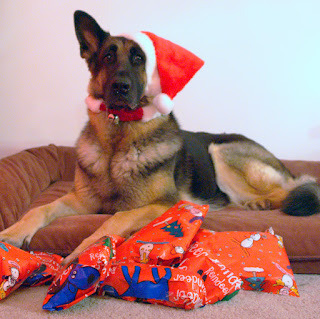 You can’t hide toys and tasty treats from a German shepherd’s nose simply by covering them with a thin layer of paper! Oh, Kate says she’s done with the photos and now it’s time for me to tell you about your Christmas gift. Leave a comment by Monday, December 18 with your sincere holiday wish, and you’ll be entered to win a copy of my most recent Downward Dog Mystery, A Fatal Twist. Don’t forget to leave your e-mail address so Kate’s author friend, Tracy, can contact you if you win. 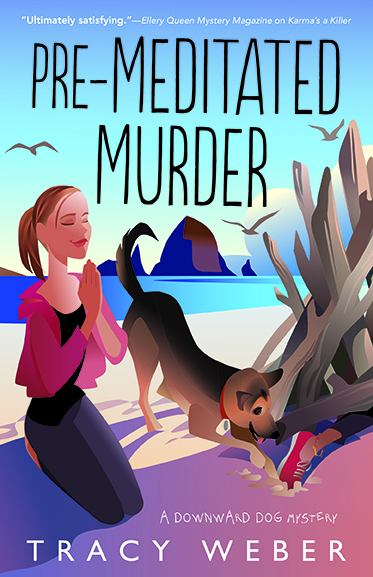 My next adventure, Pre-Meditated Murder comes out in January and is available for pre-order now! Go on, buy yourself a copy. You deserve an early gift! vboudreau57@gmail.com, happy holidays to you! What a beautiful dog. We had one very similar but he was a trained state police dog. Very good at his job and loved going to work. Amazing dogs. Happy holidays. My sincere Christmas wish is for our furbaby to adjust to taking insulin and have a very Merry Christmas. Snickererdoodle is our just turned 13 year old chihuahua. He was recently diagnosed with diabetes and is on two shots of insulin a day. We have adjusted his eating habits (and we all know how hard to change our habits are) but the we are still trying to find the right dose of insulin. So my Christmas wish is for the insulin dose to be figured out and he be happy and healthy by Christmas so he can enjoy digging into his stocking Christmas morning. Thanks for the chance to win a copy of A Fatal Twist! Wishing everyone the best of the holiday season. I hope that everyone and their furbabies will get the gifts for which they wish. Merry Christmas! What a cute puppy! Merry Christmas to all! What a beautiful dog! Is the contest open to Canadians, I love these books . And Bella is adorable. Yes, I will mail to Canada! A universal holiday wish for sanity and peace. I really enjoyed this series, would love to read "A Fatal Twist. Looking forward to reading about Bella. I wish for healthy family & friends. Happy Holidays! I wish for my Mariusz to have his bladder issues resolved once and for all and that he won't have to deal with pills and laser treatments. My wish is for peace. Merry Christmas! My most sincere wish? An education for everyone who wants one. rudycwrightlibrarian at g mail dot com. Rudy, you are the winner! E-mail me your mailing address at Tracy@TracyWeber.net. The Santa dog outfit is very cute. Heath and happiness for my friends and their families! Thanks for all of the comments. Keep them coming! My one big wish is for Peace on earth. Happy Holidays to all. I sincerely wish for a happy family Christmas! That is the best gift of all. Bella is a beautiful dog and very photogenic, too! Thanks for the contest. May your holiday season be one of ease and grace. Christmas is a time when our thoughts turn to the special people God has brought into our lives, a time to warmly remember special people in our lives who are fondly remembered, cherished, and loved today and all year through. Those who touch our lives in so many special ways... and as we remember, our hearts are warmed with love. The spirit of Christmas is Joy. The message of Christmas is Peace. The meaning of Christmas is Love. This is the season for beauty and light, for wonder and magic and hopes burning bright. This is the season for giving and sharing, for days full of laughter and hearts full of caring. This is the season for dreams coming true - The season for wishing all good things to you. May the blessings of Christmas touch your heart and bring you joy through a wonderful new year. In times like these, how wonderful it is to hold the timeless gifts of His peace and His presence in our hearts. Wishing you a Christmas and New Year filled with joy, love and God’s perfect peace. Merry Christmas everyone wishing all of you have a blessed Christmas filled with love, laughter, family, friends and peace. My wish for Christmas that 2018 will find peace in our world where love overcomes hate. Thank you for chance!!! Best wishes for a glorious Christmas season!! !